Author(s): Napiórkowski J., Romanowicz R.
Author(s): Figurski M., Gałuszkiewicz M., Wrona M.
This study introduces GPS measurements into the Narew National Park. The main task of the campaign was to develop three-dimensional information as a help in creating Numerical Model of the area. The whole methodology and technology of satellite measurements, including field work and postprocessing, is described. Double difference receivers in differential mode were used. The authors show the ability of GPS measurements in this kind of works and also the usefulness and effectiveness of the methodology described. Author(s): Kamocki A., Banaszuk P.
Protected wetland of the Narew River valley is experiencing a significant change in water resources, which results in changes in soil and vegetation and affects all groups of wildlife that are dependent on peatland and wet grassland. To counteract this loss of diversity, there is an urgent need to re-establish the appropriate water conditions in order to suppress N and P mineralization and support the development of Carex gracilis and C. elata. In order to prevent further soil transformations and satisfy the demand of target plant species it is necessary to increase the valley’s water storage by ca. 1.1∙106 m3. The improvement of hydrological conditions of wetland may be partly achieved by managed flood releases from the Siemianówka Reservoir as well as by reduction of evapotranspiration by vegetation manipulation in the form of mowing or grazing of Phragmites stands. Author(s): Okruszko T., Kiczko A. An appropriate hydrological regime within a wetland area is essential for the survival of its ecosystems. This regime is related to the water inputs which vary with the type of wetland. Swamps are characterized by a long lasting inundation formed by the flooding condition in the river, which is a main source of water for this kind of wetland. In the valley of River Narew, swamps are under protection within the Narew National Park. This paper presents an estimate of the water requirements of the Narew swamps using a hydrodynamic model and historical data prior to recent major changes in the hydrological regime of the system. Three swamp plant communities were analysed, namely: reeds, sedges and alder forest with willow bushes. The analyses were performed for seven representative valley transects. The frequency of flooding in each community for every transect was identified using 15-year historical data. The analysis resulted in the estimation of the average frequency of flooding required for the protected wetland ecosystems. Those estimates can be used as an environmental flow that should be maintained in the water system of the Upper Narew river basin. Author(s): Kiczko A., Romanowicz R., Napiórkowski J., Piotrowski A. This paper analyses the possibilities of reaching required flow conditions in the reaches of an ecologically valuable river, using reservoir management techniques. The study utilizes a one-dimensional flow routing model and a global optimisation procedure, with a special focus on ecological criteria. The methodology is applied to the valley of the Upper Narew, in north-east Poland. The work is focused on improving water conditions in the Narew National Park, which encloses one of the most valuable swamp ecosystems in Europe. The study area includes a 100 km long reach that begins at the outflow of the Siemianówka Water Reservoir and ends at the National Park. The reach of the River Narew studied has a rather complex anastomosic structure. An analysis is carried out on several historical scenarios. In each case the outflow from the reservoir is optimised to provide ecologically required flow conditions. The results point to the need for a reconsideration of the management of the Siemianówka reservoir. Author(s): Romanowicz R., Osuch M.
The aim of this work is the development of an integrated Data Based Mechanistic (DBM) rainfall-flow/flow-routing model of the Upper River Narew catchment and the river reach between Bondary and Suraż suitable for scenario analysis. The modelling tool developed is formulated in MATLAB-SIMULINK language. It has a flexible, modular structure that can easily be extended by adding new features, such as a snow-melt module or a distributed routing module. We describe the basic system structure and rainfall-flow and flow routing modules, based on a Stochastic Transfer Function (STF) approach combined with nonlinear transformation of variables using a State Dependent Parameter (SDP) method. One possible application is the derivation of a management strategy for the Siemianówka reservoir, situated upstream of the Bondary gauging station, taking into account both economic and ecological goals. Another future application is on-line data assimilation and forecasting. Author(s): Kiczko A., Romanowicz R., Napiórkowski J. The aim of this paper is to investigate the methods of maintaining desired flow conditions in the reaches of the ecologically valuable upper reaches of the River Narew taking into account the uncertainty in modelling process. The study is based on Global Sensitivity Analysis (GSA) and Generalised Likelihood Uncertainty Estimation (GLUE) techniques applied to a 1-D river flow model. We compare specified water management scenarios applied to the river and a water storage reservoir upstream. A locally conditioned GSA is used to estimate the influence of each conservation action scenario. The estimated uncertainty of model predictions is presented as a map of probability of inundation of the Narew National Park wetlands. Author(s): Osuch M., Romanowicz R., Napiórkowski J. The aim of this paper is the analysis of solute transport processes in Upper Narew River based on the results of tracer experiment. Data Based Mechanistic and transient storage models were applied to Rhodamine WT tracer observations. We focus on the analysis of uncertainty and the sensitivity of model predictions to varying physical parameters, such as dispersion and channel geometry. The study is based on a combined Global Sensitivity Analysis (GSA) and Generalized Likelihood Uncertainty Estimation (GLUE). The breakthrough curves for the chosen cross-sections are compared with those simulated with 95% confidence bounds. Apart from the predictions of the pollutant transport trajectories, two ecological indicators are also studied (time over the threshold concentration and maximum concentration). These indicators show an interesting multi-modal dependence on model parameters. The purpose of this paper is to present the numerical calculations which can be useful for simulations of inundations in natural river valleys. When estimating the reach and area of the inundation related to river flow, digital elevation model and mathematical model of flood wave propagation are indispensable. For numerical simulation of flood, the mathematical model of free surface unsteady water flow can be applied. Usually, the one- or two-dimensional shallow water equations, called Saint Venant equations, are assumed. In this paper, the simplified hydrodynamics model, known as a diffusion wave model, is presented and applied for simulation of inundation along the Upper Narew reach connecting Suraż and Łapy. The model equations are solved using finite volume method. In the paper a problem of inverse flood routing is considered. 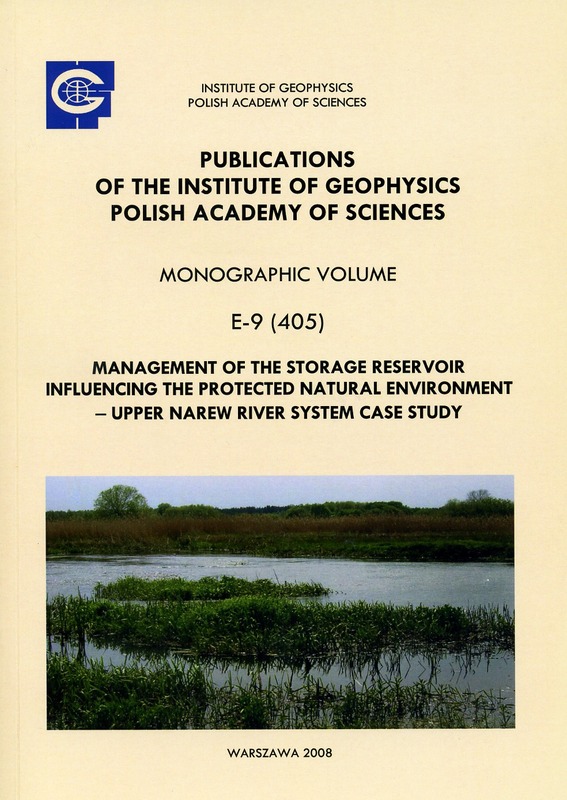 The study deals with Upper Narew River (Poland). To solve the inverse problem two approaches are applied, based on the kinematic wave equation and the storage equation, respectively. In the first approach, the hydrograph at the upstream end is determined via the inverse solution of the governing equation with backward integration in the x direction. In the second approach, the standard initial value problem for the storage equation, completed by the steady flow equation, is solved with a negative time step, i.e., with an integration towards the diminishing time. It is shown that the proposed methods are equivalent.